Appliances tend to be major parts of our homes, especially in this modern era of time. With so many appliances being used on a daily basis, many are bound to need professional servicing from time to time. When that time comes, let a real professional appliance service technician take care of everything! We offer home appliances repair in Whitby for all types of appliances, from kitchen appliances like microwaves and ovens to washroom appliances like washers and dryers. We offer fast response times and even faster repair services. It generally doesn’t take our technicians long to get an appliance fixed either. Our pricing is fair and the value is exceptional. You can always expect the best when you choose Whitby Appliance Repair. 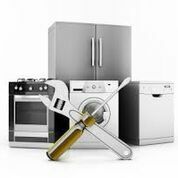 Our home appliance repair will ensure the proper repair of any home appliance. This includes common household items like fans and air treatment devices, but could also be any other appliance that isn’t labeled as kitchen or washroom type. We have a healthy sized crew that is available to meet your needs, so when you setup a house call we’ll send over one of our appliance service technicians to provide appliances repair service. One of the most used appliance types in the house are kitchen appliances. Refrigerators, stoves, dishwashers, microwaves, and so many more appliances occupy kitchens everywhere. They often receive more use on a daily basis than any other type of appliances, so they need attention in the form of repairs more often than not. That’s where we come in with professional kitchen appliance repairs. Whatever the problem might be with any of your appliances doesn’t matter; we’ll get it fixed! Appliance Repair Whitby also provides small appliance repair for those smaller appliances in your home such as blenders and hairdryers. You can’t go wrong when you choose our great prices and friendly faces, so call today!